Projects Abroad Conservation Project volunteers and the staff at Taricaya Ecological Reserve have been working to protect Peru’s critically endangered spectacled bear. After three successful bear rescues, in partnership with Animal Defenders International , Projects Abroad staff welcomed a fourth spectacled bear to the reserve in February 2017. The new arrival, Dominga, is a tiny adult female spectacled bear and was found neglected in a remote zoo in the Andean Mountains. 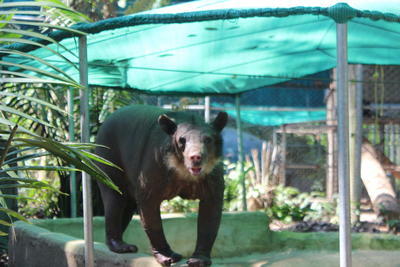 At only 43 kg, her weight was more than 25% below that of a healthy female spectacled bear. A life of stress and deprivation also led to complete alopecia (loss of hair) and skin fungi that have made her life miserable. After only a few months at Taricaya, Dominga is doing exceptionally well. She has settled in to her new enclosure, prepared for her by Projects Abroad Conservation volunteers, and has even found a favourite log platform to relax on. “It is too early to tell if she has gained any weight but she is eating like a bear three times her size, and since being treated for parasites she is expected to gain weight quite quickly in the next few months,” says Stuart Timson, Projects Abroad Peru Conservation Director. 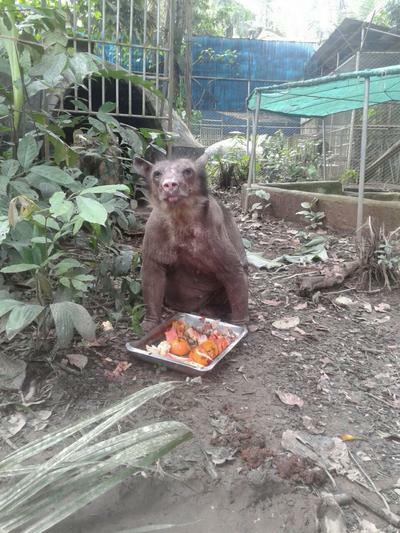 Cholita, the first spectacled bear rehomed at Taricaya in 2015, was kept illegally by a circus. Her physical state is evidence of her abusive past; her fingers were brutally cut down in order to declaw her and her teeth were broken, leaving her defenseless. Just like Dominga, Cholita also suffers from severe hair loss due to stress but staff and volunteers have noticed their progress. “In reality it is virtually impossible for them to regrow their hair but I am convinced that a few patches are a bit thicker and what little is left is definitely much shinier,” says Stuart. Cholita continues to grow in confidence and she spends her days relaxing in her pool or sleeping on her platform. She has gained close to 20% of her original bodyweight since arriving and is estimate at around 50 kg. Spectacled bears are solitary animals, and when they meet fights often happen over food and territory. Due to their physical condition, and the fact that Cholita has no claws or teeth, it is unlikely that size of Cholita and Dominga will ever share an enclosure with other bears as it is too much of a risk. They do, however, have contact and they are fully aware of each other but there is a fence that separates their enclosures. The other two bears, Lucho and Sabina, spent a combined 15 years in captivity, being harassed and prodded by people on a daily basis. Since being rescued and moved to Taricaya, the bears have regained their health and are enjoying their new found freedom. Lucho and Sabina were slowly introduced and now share the same enclosure in the hopes that they will breed during the next mating season. Although these spectacled bears will never be released into the wild, they will enjoy the rest of their lives in a spacious natural environment with good food and exercise. This is made possible by a willing team of Projects Abroad volunteers. To make sure this project can keep providing a safe and comfortable home for these spectacled bears and the other animals at Taricaya Ecological Reserve, our Conservation Project in Peru is always needing more volunteers. Find out more about our Conservation Project in Peru to see how you can contribute, or take a look at how you can make a difference at one of our wide range of Conservation & Environment Projects around the world.